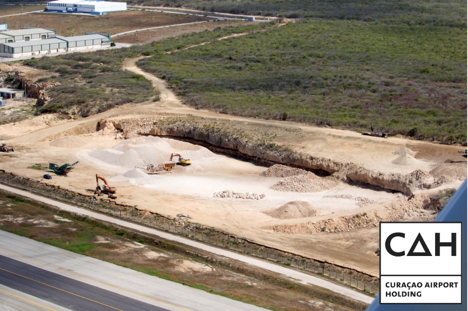 In March of 2017, the Curaçao Airport Holding (hereafter CAH) engaged a contractor to execute a boulder removal project. This project aims to clean up and mine boulders located on CAH development territories. Currently there are mining activities taking place on the areas near the west terminal, Forward Operating Locations (FOL) and the Curinde/Free Zone areas.. The removed boulders were crushed and will be sold as construction material. The company is set to continue mining, until the designated areas are leveled. The contractor was contracted to execute the boulder removal project over the course of the next 5 years on CAH property. The cleared areas allow for future developments related to CAH’s Master Plan, which seeks to bring about developments that benefit our island. 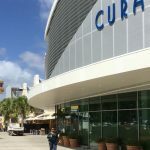 One such development that will benefit from this project is the Curaçao-Multi Commodity Centre (hereafter CMCC). CMCC is a company to be established by an investor which seeks to realize a commodities zone where the trade of gold and diamonds could take place. CAH has agreed to lease the desired territory to CMCC as it is of particular importance that its precious cargo can be transported from airside to its building in a secure manner. In CAH’s agreement with CMCC , it has outlined conditions precedent which need to be realized before the territories are leased to CMCC. 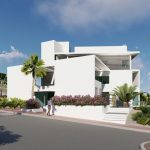 These conditions precedent consist of for example petitions for an e-zone, construction permit and a financial commitment to realize the project. CMCC received a term of 2 years to complete the conditions precedent. The timeline for the conditions precedent ends February of 2019, at which point the respective parties will need to evaluate the extent that the condition precedent have been met in order to determine how to proceed. 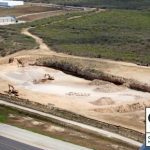 Upon being in compliance with the afore mentioned conditions precedent and awaiting the completion of the boulder project, it is expected that CMCC company can start building by approximately 2022. CMCC focuses on working with companies who trade commodities within primarily the western hemisphere. Our main objective is to ensure the quality and continuity of a competitive international airport.